Fall Mums or Flowering Cabbage is a sure way to brighten it up. number of blooms per plant will convince you that these plants were meant to put on a show. For maximum impact consider your colour scheme: if you decorate for fall with pumpkins and gourds, choose orange, bronze, yellow, and creamy white mums. If you have a lot of evergreen plants that provide a backdrop of varying shades of green foliage, try bright pinks, lavenders, pure whites, or reds. With such bold colors, a large grouping of mums can excite even the most drab of fall landscapes. Mums are frost hardy to minus four degrees Celsius which means they can handle a little frost and the cooler temperatures of a Northwestern Ontario fall. They can be planted directly in your garden, but also make great container plants. They are stunning in window boxes, or place them in a mixed planter with ornamental grass, flowering cabbage, or trailing ivy. Their compact shape and multitude of blooms makes them a fantastic fall plant in any setting. Flowering Cabbage, also known as Ornamental Cabbage is another amazing fall plant. While it is probably less well-known, it is definitely one of my favourite plants for beds, borders, and containers in the fall. 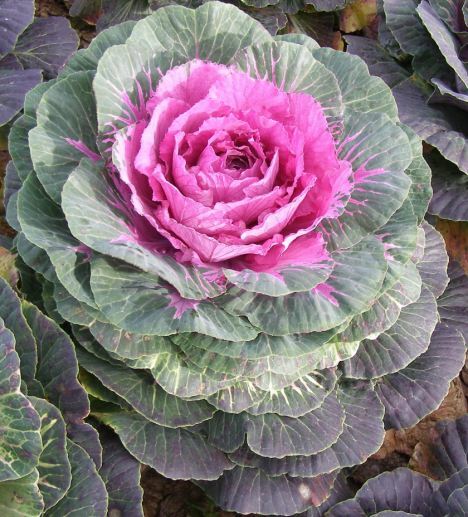 Flowering Cabbage is made up of large, grey-green leaves with rosy pink, purple or white centres. The colour of these unique plants becomes even more intense with a few frosts: as the temperature drops these plants lose their chlorophyll, changing from green to white, pink, purple, and near-red. Cabbage look exceptional in large plantings, but don’t count them out for containers! They make great focal points in mixed planters yet are equally impressive on their own. You can also mix them with Fall Mums in beds and borders for a bright fall feel. These plants are even more frost hardy than mums, surviving temperatures of up to minus ten degrees Celsius! While planting your Fall Mums and Flowering Cabbage take some time to clean up the garden. Remove annuals that have finished flowering, and cut back perennials that have died back. Clean up loose foliage and leaves to keep your garden looking tidy. Consider planting some fall bulbs such as tulips or daffodils so you can look forward to some early spring blooms. A little bit of time spent now will leave you one step ahead come spring. If you want to add to the look of fall around your home consider decorating with corn stalks, scarecrows, and straw bales (which you can later use to protect tender plants). Add a fall wreath to your front door, or a spray of fall silks at the front entrance. While fall may mean a drop in temperatures, it doesn’t have to mean the end of your garden. A few Fall Mums and some Flowering Cabbage can extend your growing season, provide a burst of fall colour, and add to the enjoyment of your yard and garden.